Sharon gets to combine three of her passions, Fitness, Learning and People Development in her role as a freelance Fitness Industry Tutor, Course Developer and Assessor and delivers a range of REPs endorsed L2, L3 and L4 fitness related courses and CPD modules. Sharon has taught a range of courses for Lifetime including Level 2 Certificate in Fitness Instructing and Level 3 Certificate/Diploma in Personal Training and a range of CPD courses where she excelled, enthusing and inspiring learners due to her warm delivery skills and her personal skills and experiences as a fitness professional who practices with clients every week. Sharon has been a primary choice due to her professionalism, breadth of delivery and her skills. Lifetime prides itself on working with high profile partners within the leisure and fitness sector. I always aimed to schedule Sharon to deliver to the important contracts as I was certain of an exemplary result. Partners including, LA Fitness, Fitness First, Birmingham City Council, DC Leisure have indeed asked for Sharon by name given her reputation, skill and professionalism in training young people to acquire qualifications which in some cases may have felt out of reach for some. Sharon continues to deliver for Lifetime and has acquired this longevity as the first choice freelance Tutor through her tenacious appetite for learning, her commitment to continued professional development and the demand that comes from the learners, students and professional partners themselves. I recommend Sharon as a highly skilled health and fitness professional who has become an ambassador for the principles of exercise and healthy living through dedication and uncompromising belief in others to change behaviour and live better lives. Sharon has delivered a number of short courses and full programmes for me over a number of years and I can't speak highly enough of the standard of work and attention to detail that she possesses. Sharon is reliable, versatile and has an exceptional ability to develop excellent working relationships with learners and people around her. Her knowledge, creative ideas and writing ability position her in a league of her own and she is an absolute asset to any team that are fortunate enough to have her on board. Lifetime Training has spent nearly two decades providing training expertise to the fitness industry. The Lifetime brand assesses and trains over 15,000 new candidates each year – and consistently delivers above the national average in learner completion rates. Sharon has recently been awarded an OFSTD level GRADE 1 Outstanding Observation from Lifetime Training. Sharon delivers a wide range of courses for Lifetime training across the United Kingdom. Discovery Learning has been delivering training in the weight management and fitness field since 2001. Alongside our sister company Weight Management Centre, our mission is to provide and communicate accurate, meaningful information and high quality training relating to all aspects of fitness, weight management and obesity. Our organisation prides itself on the quality of the training that it delivers, as well as the high levels of support offered to delegates before, during and after training. The feedback from our awarding bodies is always excellent and we pride ourselves with a continuous low risk status during independent quality audits. We are currently one of ten providers on the Department of Health's Directory of Obesity Training for Primary Care. Sharon delivers L4 Obesity and Diabetes Management for Discovery Learning. We recognise that the the journey to become a truly respected fitness professional is a continual one which takes time, commitment, hunger and patience. Over the years we've seen many trainers who are not achieving their true potential, most often due to a lack of understanding of the core-concepts and technical knowledge that their clients should be able to take for granted. We believe that this not only fails these clients but is damaging to our industry. As our answer to this problem, we've created a new training company called 'Primal Academy' with a different approach to fitness education. Sharon delivered a range of L2, L3 and CPD courses for Primal Academy. Fit to Train is an AIQ accredited Training Centre and is excited to offer accredited and recognised fitness qualifications to existing and new fitness professionals. At Fit to Train we believe that your group or individual clients deserve the best – highly motivated & highly skilled professionals who deliver great training and customer service. That's why we are with you all the way for as long as you need us and we can add value to your career. 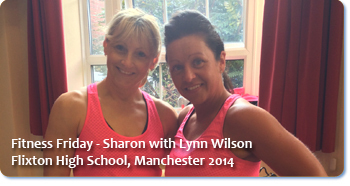 Sharon supports in running FITNESS FRIDAY, an innovative approach to Fitness and Nutrition in schools. In partnership with Flixton High School. Manchester.